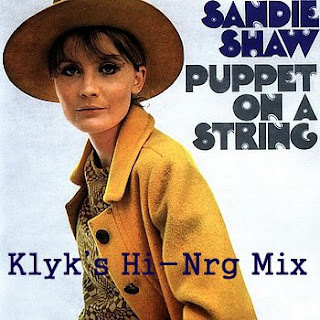 "Puppet on a String" is the name of the Eurovision Song Contest-winning song in 1967 by British singer Sandie Shaw. It was her thirteenth UK single release. The song was a UK Singles Chart number one hit on 27th April 1967, staying at the top for a total of three weeks. The song is not to be confused with the Bennett-Tepper song "Puppet on a String", which was performed by Elvis Presley. Shaw had originally performed the song as one of five prospective numbers to represent the United Kingdom in the 1967 Eurovision Song Contest on The Rolf Harris Show. She had never been taken with the idea of taking part in the contest but her discoverer, Adam Faith had talked her into it, saying it would keep her manager Eve Taylor happy. Taylor was wanting to give Shaw a more cabaret appeal and felt that this was the right move - and also felt that it would get Shaw back in the public's good books as she had recently been involved in a divorce scandal. Of the five songs performed, "Puppet on a String" was Shaw's least favourite. In her own words "I hated it from the very first oompah to the final bang on the big bass drum. I was instinctively repelled by its sexist drivel and cuckoo-clock tune." She was disappointed when it was selected as the song she would use to represent the country. Shaw won the contest hands down, though it has always been felt that this was partly down to her existing popularity on the continent (she had recorded most of her hit singles in French, Italian, German and Spanish). As a result "Puppet on a String" became her third Number One hit in the UK (a record for a female at the time) and was a big worldwide smash (the biggest selling single of the year in Germany). Shaw re-recorded "Puppet on a String" in early 2007 in honour of her 60th birthday. This took place after Shaw visited her friend, musician Howard Jones and found him playing some chords on his keyboard and humming a melody. He encouraged her to continue the melody and before long she realised that it was in fact "Puppet on a String." They recorded the new, slow-tempo electronic version of the song and sent it to producer/mixer Andy Gray who put the final touches on the song. Shaw stated that she loved the new version (having spent a great deal of her life hating the original) and released it exclusively for free download from her official website on the 26th February (her actual birthday). It was available for free download for sixty days. As a result of its popularity, Shaw continued to put out new songs on her website for download for the remaining months of her 61st year. Here in all it's glory is my re-working of the catchy little tune. I like these hi-nrg reworking of songs, and you can hear it's done by a pro!